This unique book shows how chemistry and physics come together in the solid state and on surfaces. Using a lively, graphic, descriptive approach, it teaches chemists the language that is necessary to understand the electronic structure of extended systems. And, at the same time, it demonstrates how a chemical, frontier-orbital, approach to solid state and surface bonding and reactivity may be constructed. The book begins with the language of crystal orbitals, band structures and densities of states. The tools for moving back from the highly delocalized orbitals of the solid are then built up in a transparent manner; they include decompositions of the densities of states and crystal orbital overlap populations. Using these tools, the book shapes a meeting ground between detailed quantum mechanical calculations and a chemical frontier orbital perspec- tive. Applications include a general picture of chemisorption, bond-breaking and making in the solid state, bonding in metals, the electronic structure of selected conducting and supercon- ducting structures, dissociation, migration and coupling on surfaces and the forces controlling deformation of extended systems. 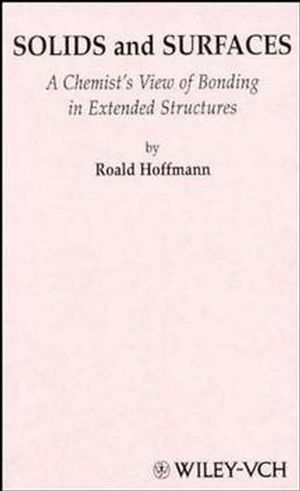 Roald Hoffmann, born in Zloczow, Poland but educated in the US, is the Frank H. T. Rhodes Professor of Humane Letters at Cornell University. One of America's most distinguished chemists, he was awarded the Nobel Prize in Chemistry. A member of the US National Academy of Sciences and the American Academy of Arts and Sciences as well as many foreign academies, Hoffmann has received 26 honorary doctorates together with numerous other honors such as the National Medal of Science. Hoffmann is the only person ever to receive the American Chemical Society's top awards in three sub- disciplines: organic chemistry, inorganic chemistry, and chemical education. For the past dozen years, Hoffmann has simultaneously pursued a literary career. He is the author of three books of poetry, "The Metamict State", "Gaps and Verges", and "Memory Effects". His three non-fiction books deal with the overall theme of the creative and humanistic sparks of chemistry: An art/science/literature collaboration with artist Vivian Torrence, "Chemistry Imagined"; "The Same and Not the Same"; and "Old Wine, New Flasks: Reflections on Science and Jewish Tradition," in collaboration with Shira Leibowitz Schmidt. Hoffmann is also is the presenter of a television course, "The World of Chemistry", which has aired on many PBS Stations and abroad.